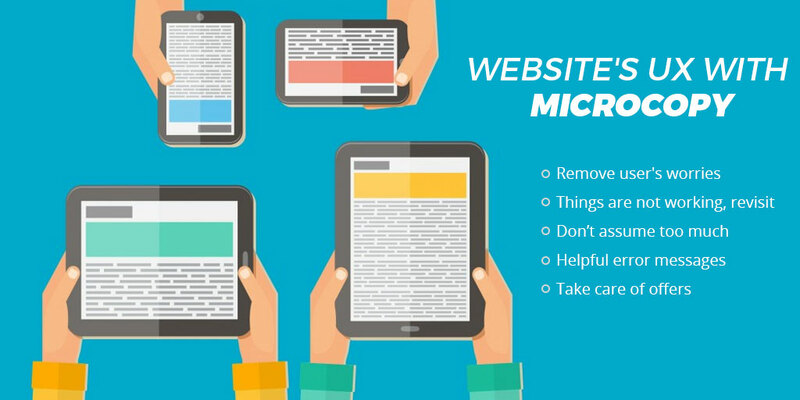 Microcopy is very useful as only two words are capable of enhancing the sale of the site or can drastically increase the conversion number. Don’t mistake it for a simple verb written on a button. It’s a word which shows your potential clients how sign up for your newsletter, how they can sign up or how they can navigate through your website. If you are amazed on the fact that you never though it this through then don’t worry because you are no alone in this. Below are some tips which can help you with little text which in turn will pay in a big way. Don’t just rush to fill in the blanks on buttons and forms; instead do some brain storming on what you want from the user. If the microcopy is rushed or not though through then user can it is your user who suffers which is not good for any kind of business. For example some sites uses ‘GO’ as a microcopy for both search and registration fields and if on your site search and registration fields are close then using ‘Go’ for both can and will cause confusion for the client. In that case make them say ‘Search’ and ‘Sign-in’. Microcopy can also be used to handle doubts of clients. If you think that your client will worry that registration can take time then add a microcopy saying “You are only [x] seconds away from the registration”. Try to showcase user that everything is just around the corner and they need to be little patient for that. Another famous microcopy can be “Sign in and start connecting”. When the site is underperforming then some simple copy tweaks can work miracle for you. For example, if during the registration user is having problem entering the address then simply make it clear by adding “enter the billing address associated with the credit card” and it will work miracles. The long process where users have to figure out it by themselves is totally eliminated and what address is require is clearly mention on the site so no question of getting confused now. If the flaw lies in your site’s basic design then don’t expect microcopy to work like a magic wand. Your only option is to fix the design. No arguments. Best designs are not on the mercy of microcopies because they are intuitive with natural flow. Human language is ambiguous and can create confusion. What you say can be interpreted in totally different way by any other person. So your choice of words for microcopy is not working! What are your options? Usability testing is here for the rescue and it will make clear that which parts of microcopy are clear and by which your customers are getting confused. After testing make the required changes. Always give user the information what went wrong. Majority of sites says either username or password is wrong. Why on God’s earth I have to figure out, when you already know say directly. Talk to users like there is a person on the other side not a server. Say “credit card number is too short” instead of invalid input. If you are in mood of giving something away for free then your microcopy should read “Click here to download our [X] for free”. Remind your user that it is free at every step and there are no surprises. Making them sign-up for something only to reveal that there is indeed money involved will make them run away in anger. Not every designer or developer thinks about the microcopy in detail. But if you will you users will love your authenticity.